Nuk First Choice Latex Size 2 Medium Teat is ergonomically designed with the special orthodontic NUK shape. Nuk First Choice Latex Size 2 Medium Teat is ergonomically designed for an extra wide lip support to simulates breast feeding as closely as possible - to allow your baby a familiar feel.These special treats allow air to flow into the bottle through a vent to ensure that no air is swallowed during feeding and will help in preventing colic. 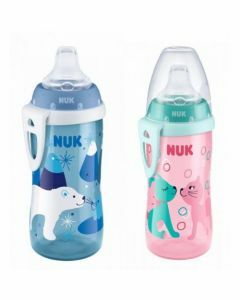 Sterilise bottles and teats using steam, cold water sterilisation or NUK Steam Microwave Steriliser. Dishwasher sterilisation is not suitable as this can cause material damage.